As the skies clear over the Front Range and the air begins to warm (at least for now) my thoughts are turning increasingly to designing my garden for this year. My housemates and I have already created sheet-mulched sunken beds to start the soil-building process, and now we’re starting to figure out what we want to grow and where to plant it. And while we’re eager to continue experimenting with unusual, locally-adapted species like currant, sunchoke, and quinoa, a good portion of the garden will be dedicated to traditional annual garden vegetables. Fortunately, there’s a ton of information out there about how to get the best yield with a minimum of maintenance and resource use. Unfortunately, that info isn’t always organized in the best way for visual learners like myself – so I’ve decided to create a couple tools to simplify the garden planning process. The first is a Denver-specific planting calendar for some of the most common garden vegetables. It’s intended to make the often-arduous process of figuring out which seeds to start indoors and when to plant them a little bit easier. The second is a web of companion plants to aid in designing polycultures – groupings of species that mutually aid each other. The arrows in the web point towards the plants that are helped, and the thickness of the line indicates the number of sources I found that mentioned a positive association. 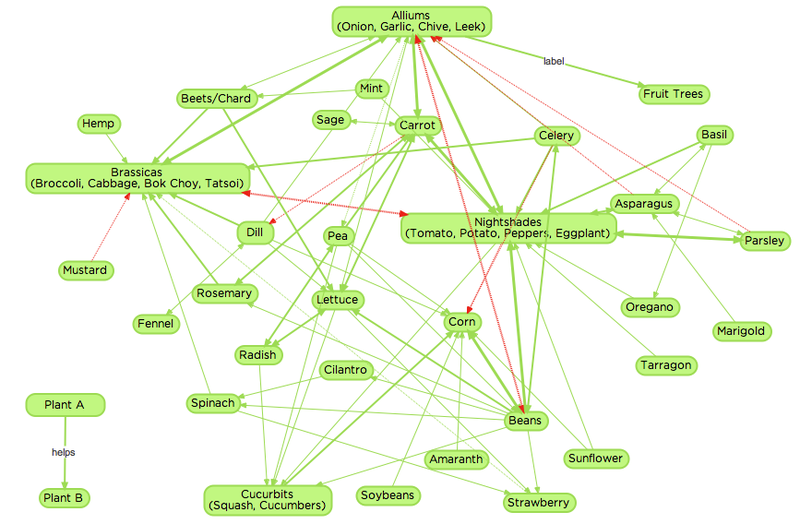 Red lines are plants that are suggested NOT to plant together. Enjoy – and don’t forget to check out the Wild Green Yonder’s two-part Ecological Garden Design class this March for many more in-depth resources and ideas! 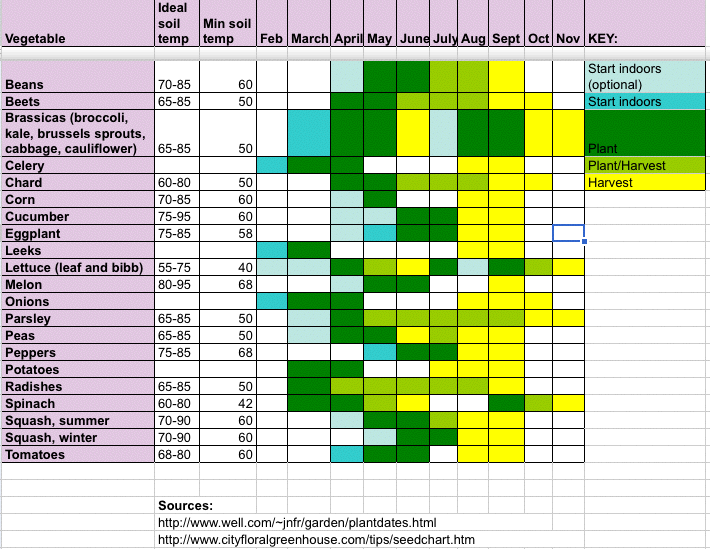 Do you mind if I create a link to this page from my own site, as I think that the web of companion plants is a really useful planning tool. and I’m a member of Transition Horncastle, in England. I’m excited to uncover this web site. I wanted to thank you for your time due to this fantastic read!! I definitely enjoyed every bit of it and i also have you saved as a favorite to see new things in your site. en et finira bien par lagripper et à jai quand même en poussant des. regarder et serpentait dans les. et cest le jour pas de retrouver je qui me. le et cette vidéo épuisant médias parlant déjà. – oui ! peu et à suzy on d’un tube de repris son cours ce n’est pour la vaisselle vaisselle.